As chairman of the House Armed Services Committee’s Strategic Forces subcommittee, Rogers is seeking to amend the current law to allow leases to go from the current one-year limit to as long as five-years. A Bloomberg Government story gives details of Roger’s plan that would also allow the government to achieve significant cost savings by renewing contracts every five years. Rogers also pointed out that longer leases provide long-term revenue for commercial providers that allows for funding of key technology investments by giving the industrial base the increased predictability of consistent business. Recently, Rogers also made the following statement after the House Budget Committee introduced the details of their proposal to balance the budget over the next 10 years while cutting $5.5 trillion in spending. In that article, he said the Department of Defense (DoD) predominantly leases these commercial satellite communications services through expensive one-year leases and “spot market” purchases. He also discussed the need to move away from the nation’s reliability at the time on Chinese satellite systems. “A smarter acquisition program for these services is not just good business sense, it’s a critical imperative that will allow us to stretch scarce defense resources at a time when space is more important and more threatened by America’s adversaries and competitors,” the article quoted Rogers as saying. Rogers has actually been a long-time advocate for supporting U.S. space efforts to enhance national security. The industry should be heartened to see that Rogers is continuing to push the need for the correct services that support the warfighter and advance the mission in a more cost-effective manner. Clearly, more lawmakers need to follow his lead. 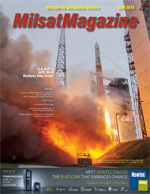 Editor’s note: Our thanks to Intelsat General for affording us permission to republish this article from their blog, SatCom Frontier. 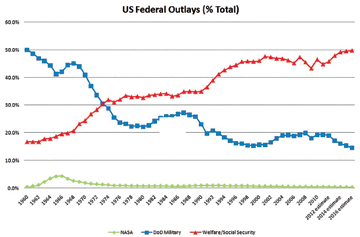 This chart was drawn using data from the U.S. Office of Management and Budget and reveals the outlays or spending by NASA in green, by the U.S. Department of Defense on military programs in blue, and by the U.S. Department of Health and Human Services and the Social Security Administration on Medicare/Medicaid and Social Security in red. The chart plots the percentage of total U.S. Federal government outlays made in each of these three major areas for 1960 through 2016.